New Day Packaging products distribute a wide range of strapping and tape supplies for securing heavy items, industrial cargo, and shipments. 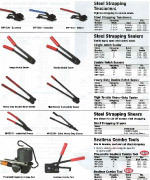 We offer tensioning tools, sealers, and shears that are ergonomic and easy to use. Our strapping materials are available in wax coated steel, machine grade polyester, weather resistant polyester, and polyester cord form. They offer incredible strength characteristics; easily spreading tension and supporting weight over cartons, boxes, and other shapes without damage. 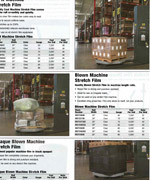 We also carry various guards, buckles, protectors, and dispenser carts for strapping operations. For box corners, our edge protectors are sold by the case and provide secure corner protection when used in conjunction with stretch film or strapping. Our diverse inventory of paper packaging solutions are sold in either waxed, kraft, single face corrugated, or indented forms. 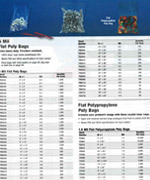 Available in sheets or rolls, these are bio-degradable, recyclable, and will conform to any package size or shape. For identification, our transfer labels work on Zebra, Datamax, or Sato thermal printers. 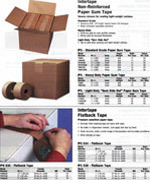 Easily adhering to corrugated cartons and containers, they're sold in a variety of colors. 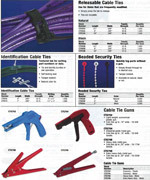 For identification, anti-theft, and other applications, we sell plastic seals, zip ties, and cable ties. They include features such as consecutive numbering, padlock configuration, text markings, and general tagging colors or codes. 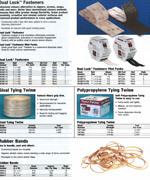 We also carry Velcro tape that can attach and reattach items quickly using an adhesive hook and loop fastening system. They work great for securing products, bundling wires, or organizing cords. With our paper gum tape, we can offer secure closure solutions for light-weight cartons that allow users to easily tear them open by hand. They can work under a variety of temperature and humidity conditions, providing good bundling on packages. Finally, we sell a complete line of industrial grade tapes with options including labeling, transparency, cloth, duct, foam adhesive, double sided, safety, transfer, PTFE, aluminum, packing, and electrical.